On February 9, 2018, Mississippi was notified a white-tailed deer tested positive for Chronic Wasting Disease (CWD). The Mississippi Department of Wildlife, Fisheries, and Parks (MDWFP) implemented its response plan (available online at www.mdwfp.com/cwd) immediately after being notified of the positive deer. Determining the extent and prevalence of the disease through sample collection. Since that day, MDWFP has collected more than 500 samples from road-killed, reported diseased deer, and targeted sampling operations within the state’s 25-mile CWD Management Zone. So far, the initial deer, a 4.5-year-old buck, is the only one that has tested positive for CWD. To date, all other submitted samples from Mississippi have returned as “not detected” for CWD. Also, Louisiana Department of Wildlife and Fisheries (LDWF) has sampled deer in the three parishes within the CWD Management Zone, which extends across the Mississippi River. Out of more than 230 LDWF samples, all tests returned as “not detected” for CWD. To continue the effort of determining the possible origin of CWD and extent of the disease in Mississippi, sampling will continue throughout the 2018-2019 hunting season. Samples will be collected from hunter-harvested, road-killed, and reported diseased deer. The infected deer died of natural causes and was reported by hunters in Issaquena County to MDWFP on January 25, 2018. CWD was confirmed on February 9, and, a few months later, a secondary test on the same tissue supported the initial finding. CWD is a contagious, fatal prion disease that is known to affect white-tailed deer, elk, mule deer, sika deer, moose, and reindeer. It is similar to Mad Cow Disease in cattle and Scrapie in sheep and goats. CWD appears to be caused by one or more strains of infectious prions, which researchers have identified as an abnormal protein. The theorized origin of CWD is exposure of native deer and elk to the sheep scrapie agent at one or more times and locations. It also can take more than a year before an infected animal develops symptoms, which can include drastic weight loss (wasting), stumbling, listlessness, and other neurologic symptoms. There are no treatments or vaccines. Prions are found throughout the body of infected animals but are found in higher concentrations in the eyes, lymph, and nervous tissues. Infected animals shed prions through saliva, feces, blood, and urine. Other animals can become infected through direct contact with an infected animal and indirect contact with an infected environment. Research has shown that decomposed carcasses of infected animals can also contribute to transmission. Plants can bind prions superficially and uptake prions from contaminated soil, resulting in possible infection to the animal eating the plant. Prions in the environment are found to be more infective in particular (clay) soil types. There is no known method to decontaminate an infected environment. According to the Centers for Disease Control and Prevention, there have been no reported cases of CWD infection in people. However, animal studies suggest CWD poses a risk to some types of non-human primates, like monkeys, that eat meat from CWD-infected animals or come in contact with brain or body fluids from infected deer or elk. These studies raise concerns that there can also be a risk to people. Since 1997, the World Health Organization has recommended that it is important to keep the agents of all known prion diseases from entering the human food chain. Import live CWD-susceptible cervids (members of the deer family) into the state. Transport certain portions of a cervid carcass into Mississippi from states that have discovered CWD. 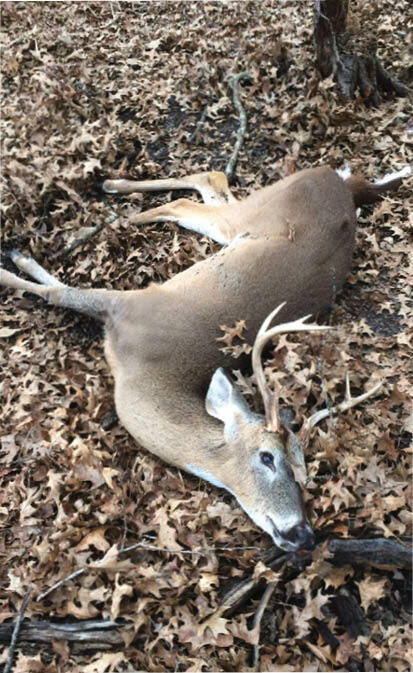 As the 2018-19 deer season approaches, MDWFP’s primary focus regarding CWD continues to be prevention for most of the state. Where CWD has been detected, the best science will be used in the management of the disease. MDWFP will continue increased sampling efforts in the CWD Management Zone. CWD sampling will also continue statewide through road-kill, sick deer, and hunter-harvested deer. MDWFP will continue to inform the public through various channels. Please report sick or unhealthy deer by calling 1-800-BE SMART or by visiting www.MDWFP.com/diseased. Please report violations of live deer or carcass importation by calling 1-800-BE SMART. Help us keep our deer herd safe.